I think I've made about 30 Mabel Skirts since the pattern was released (no exaggeration). Some successful. Some destined for the bin. 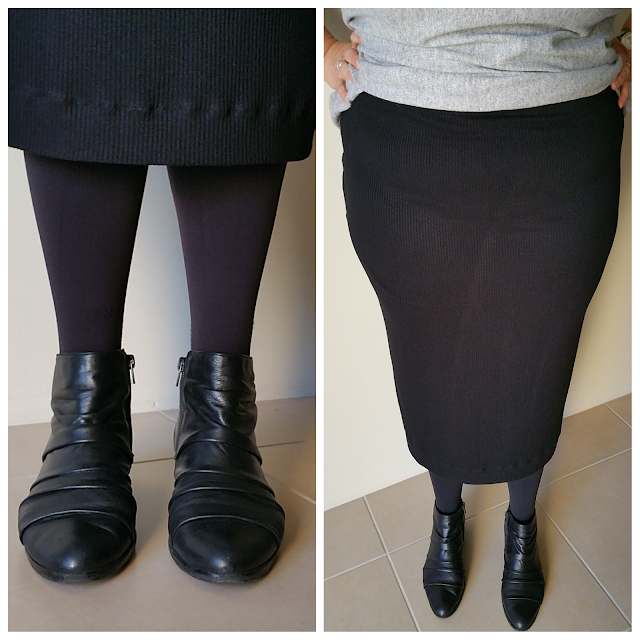 About a week ago I started obsessing about NEEDING a black calf length pencil skirt. No idea where the desire came from but I thought I'd better make it happen! 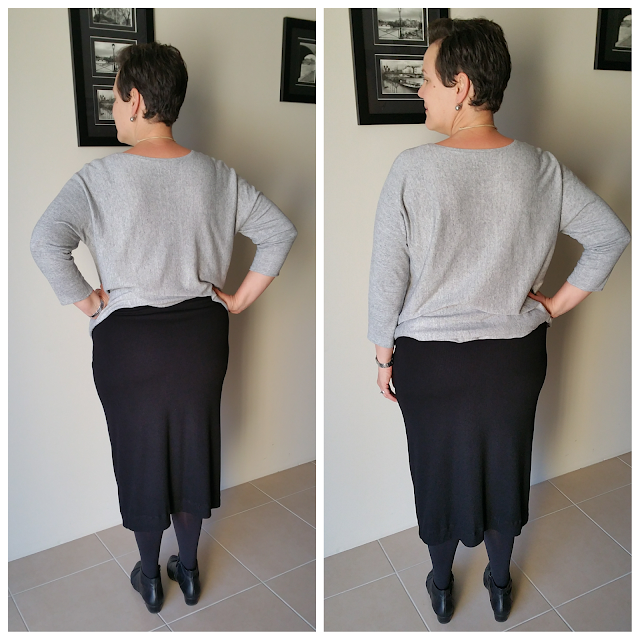 The fabric is a ribbed jersey from The Remnant Warehouse...bought online when I was searching for ribbed knits. I'd originally set out to make a Simplicity 1366 dress from it but the neckline stretched out and the whole thing looks frumpy. I couldn't rescue the fabric despite trying so ordered more specifically for this skirt. I'd already lengthened View A of the pattern to make it knee length on me, plus 10cm added to accommodate for the wide elastic waistband I use. I then lengthened all of this by 20cm and added a 2" hem to get a length that hits just below my calf. I pegged the skirt in a bit at the bottom and think it would be better a bit more fitted still - but then I might not be able to walk, which could be an issue? 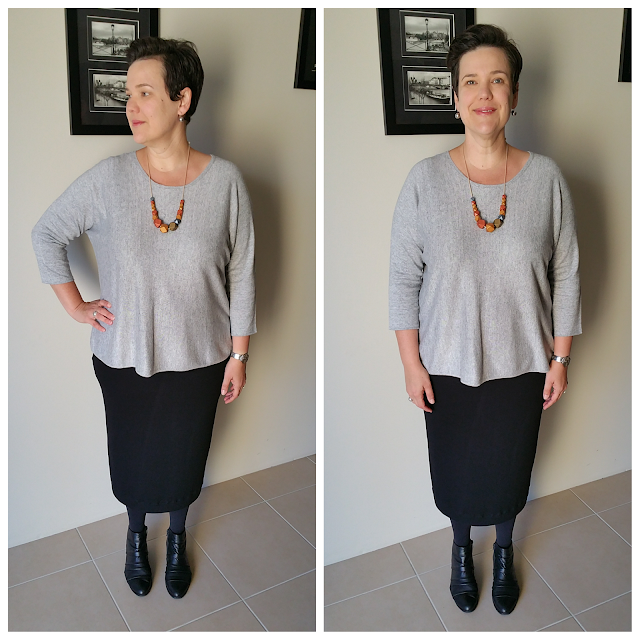 The weather is cooling down in Sydney now (thank goodness) and I am keen to find some ribbed wool-knit to make a snuggly winter-version of this skirt. Any ideas where one could find such a fabric in Oz? Modifications: 5cm elastic waistband (added 10cm to the pattern to accommodate for this), 35cm added to length, pegged in the bottom by. 1cm added to the CF and CB to accommodate for middle-aged spread.